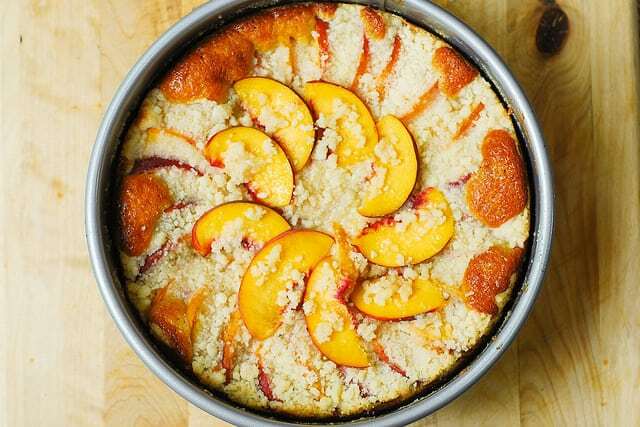 Peach Cream Cheese Cake made in a springform pan – the light and fluffy cake (made with Greek yogurt), creamy cheesecake filling, delicious peaches, and a crunchy streusel topping! I love baking with Greek yogurt and avoiding using as much butter as I can get away with. 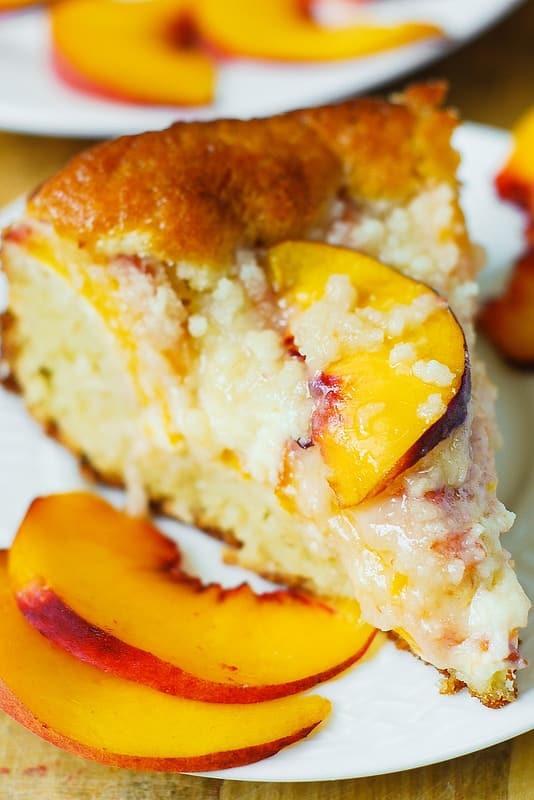 There isn’t too much butter in this peach cream cheese cake, yet the texture does not suffer, in fact the Greek yogurt makes the cake lighter and fluffier! You’ll love this pretty cake. Storage tip: keep this cake refrigerated as it has a cream cheese filling. Bake the cake for about 45 minutes to 1 hour, depending on your oven. 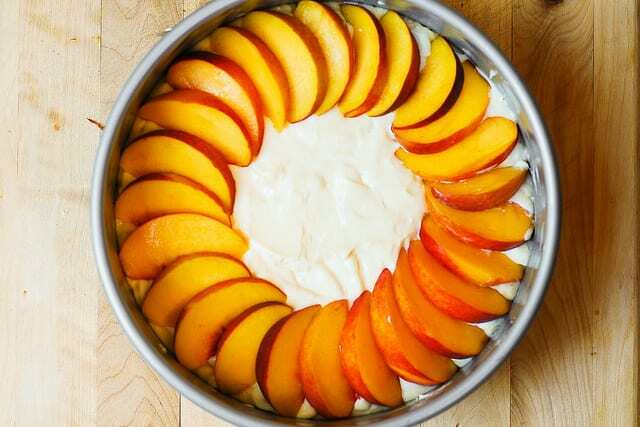 After cake has cooled for about 40 minutes, release the cake from the springform pan, and top your cake with the remaining sliced peaches around the center of the cake. 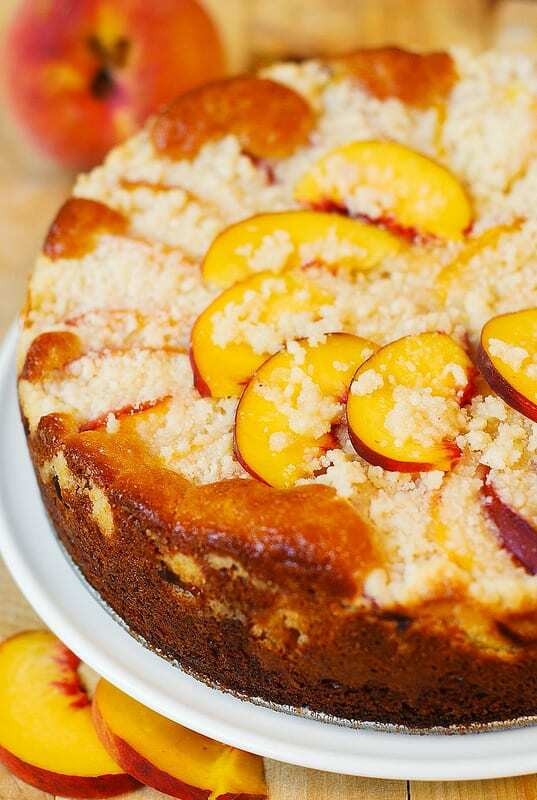 Peach Cream Cheese Cake made in a springform pan - the light and fluffy cake (made with Greek yogurt), creamy cheesecake filling, delicious peaches, and a crunchy streusel topping! Preheat oven to 350°F with rack in middle. Line the bottom of a 9x3-inch springform pan with parchment paper. Grease the sides of the pan with butter or cooking spray. Combine the sugar, flour, and butter (chilled and cubed) in a medium bowl. Mix with hands, or fork, or a pastry blender until crumbly. Set in the refrigerator until ready to use. In a medium bowl, using electrical mixer, beat softened cream cheese and granulated sugar until smooth, for about 30 seconds. Add vanilla extract and an egg, and beat for about a minute more until combined and very smooth. Set aside. Bake until the cake turns golden, and the tester comes out clean in the center, about 45 minutes to 1 hour, depending on your oven. When the cake is done baking, let it cool (still in the baking pan) on a wire rack. After cake has cooled for about 40 minutes, release the cake from the springform pan. 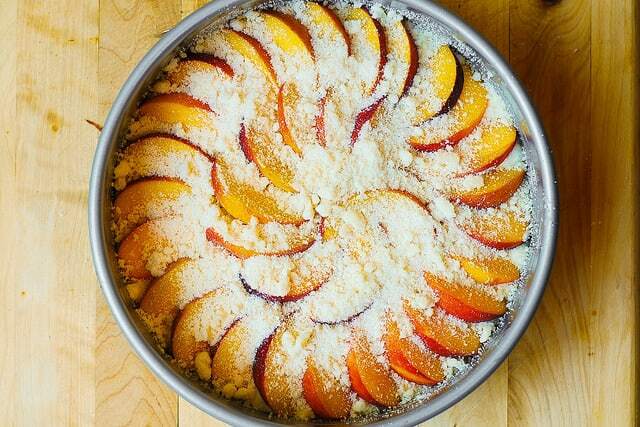 Slice the remaining one half of the peach into very fine slices, and top your cake with those slices, scraping and putting streusel on top of these slices, for decorating purposes. Thanks, and thank you for making the recipe, printable, I hate it when I spend the time to check the recipe out, the can’t download the recipe. Looks great even for a single guy of 61 years like me to make. I hope you made this cake and liked it! 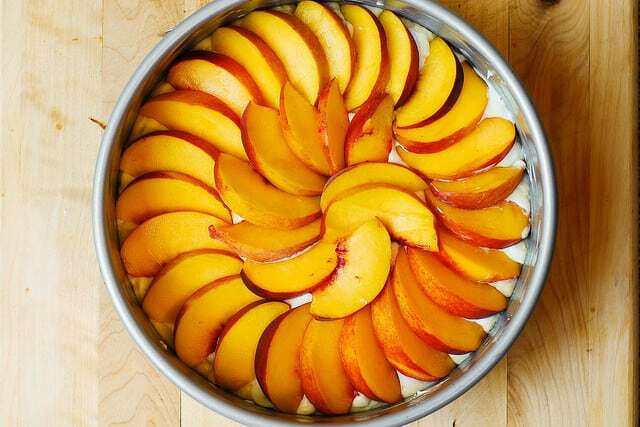 I put 4 peaches and it was fantastic. Instead of cream chesee I put non fat quark cheese. Glad you liked it! Good to know that non-fat quark cheese worked in this recipe! Lovely recipe. I would reduce the streusel topping by half. 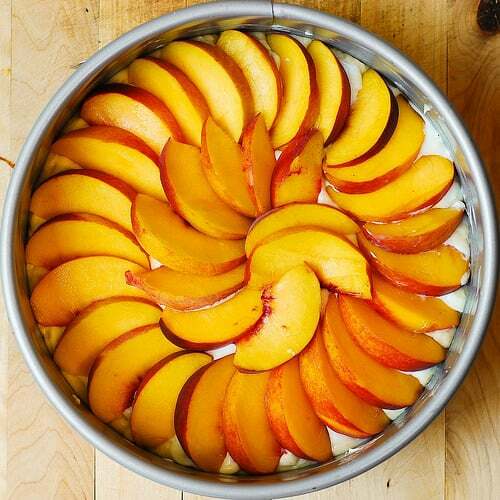 It’s nice to see the peaches when serving.